If you are looking for a unique modern gift -- check out these mantel clocks designed by France's Cédric Ragot of the 'designedbyitem' firm for London-based Innermost. I found these little "time capsules" striking and adorable. Seattle glass artist, Jean-Pierre Canlis, designed this blown-glass chandelier. The eight 'organic raindrops' hang from a 36" round metal base and are designed to be lit from the exterior, causing the drops to illuminate for a dramatic look. 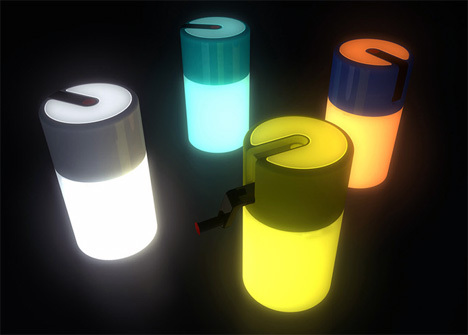 Great concept light by Australian designer Kenan Wang. Crank the handle to power the battery and turn on the light. Love the idea of tying electricity output to exercise (thinking specifically of my kids' X-box). Hmmm, according to our Brit friends at MyDeco the skull motif is skulking its way to become a fashion icon. Check out the wallpaper from Beyond the Moon -- bronze flocked on bronze velvet pile -- available in black/gunmetal and gold -- in case you were wondering. So while boho chic is out, death is very much in, and with Halloween looming at the end of the week we need to start embracing the darker side! Pure Contemporary recently featured great ways to bring the outdoors in -- and our friend Anne Robert provided this gem by French firm Les Ateliers Ouvert. Made of eco-friendly material (aside from the herbs), la table-potagère (the kitchen garden table) -- is by all accounts "Green Design": A portable herb garden, that allows modern cooks the joy and essence of fresh herbs. Importing from France will be about $1600 with duty and shipping, so it is not an impulse buy. We're waiting word from the company to see if plans for distribution in the US is imminent. Chilling with friends outdoors shouldn't mean shivering. So we have our eye on patio heaters. Here's one from Grand Hall, the Taiwan-headquartered grill company. Grand Hall has taken the gas-fed heating elements and turned them on their side -- to make this free standing patio heater. The 6' high heater also includes sound system and LED lights. iPod® and refreshments not included.